Got a last minute call from a friend saying he’d got a spare London to Brighton place. That was on the Thursday. So once we’d figured out the logistics of getting 3 bikes, 3 blokes, 1 dog, a load of kit and a very understanding wife in a golf we were on. Perhaps not the obvious choice for a social London to Brighton bash, but the tallboy was the only bike really prep’d and ready. So with tyres pumped up to 60psi it was loaded on the car for the long drive. The other bikes no show were a Cannondale tallboy and a lovely tricked out pace hardtail. The event was like nothing I’d ever seen before. 27,000 bikes in the centre of London. Even with the staggered start the roads were rammed. This level of traffic remained all the way to Brighton, at every junction and slight incline. The other great thing about this ride was the mix of people and bikes. Every possible type of bike was on display. As with the Bikefest people on BMX got the most respect, as did the dudes on their original 70’s choppers. I managed to get most of the way out of London before the urge (and the space) to test the legs allowed for a bit of light hearted racing. Mostly with fully kitted out roadies I must admit. 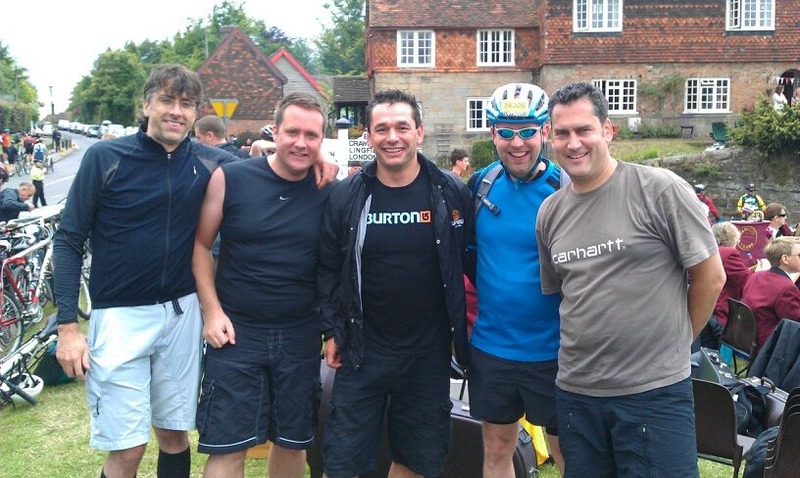 Managed to catch up with the guys at the half way point and stopped for a bit of brass, a pint, a bun and a photo. With most of the little climbs out the way the route was now straight and flat until the final and steep road up to Ditchling Beacon. I must say this climb was the highlight of the ride for me. Thankfully everyone left some space on the right, and so it was possible to ride the whole thing. Even managed to make a few people swear behind me when I put in a final turn of speed when the finish was in ear shot. So waited at the top with an ice cream in the rain and then it was downhill all the way. We saw two nasty crashes on the wet and slippy roads. Unfortunately by the time we were in Brighton we didn’t get a chance to see the sea, and were quickly packed on our way back home. A long (in time if not distance) but fun ride and a nice change for this time of year. A mile in Zone 5. 5:30 wake up call, short drive to Marlborough, before picking up someone from Maidenhead and then onto Clapham common.